Herc and Max getting the ole’ nest ready for baby season. I fervently hoped that this year, they’d choose to nest on the north side of the building rather than the west side, as they did last year. As anyone who read last year’s journal entries knows, watching them on the western exposure presents quite a challenge. First things first, it seems that many of my friends from the garage moved on over the winter. Sadly, I won’t be seeing Tyrone, Tom or Nichelle this year. I suppose that’s sort of the way these things go, but they will be missed. So, back to the jail birds. As I mentioned in my last post, Sean and I saw two adult peregrines in the western facing niches early in March. On my first trip up to the garage top last week, the first thing I noticed were prey scraps on the northern facing niches. Hoping this meant that the MCC adults were spending time on that face, I got my binocs out to take a closer look. All of the remains seemed pretty old – not a good omen. Next, I checked some of the favorite eating spots. All were unoccupied, but plentiful evidence existed to prove recent occupation. Various bird parts adorned the tops of at least three of the lighting fixtures on the Board of Trade Annex. While some of those parts looked old, many looked fresh enough to be leavings from a very recent meal. On the garage top itself, I found a few pigeon legs (old) and one very, very fresh … something feathery … on the corner of the stairwell building roof. This was SO fresh, in fact, the peregrine eating it might have just left as I arrived. Blast. After about 20 minutes, I heard a falcon call and spotted two adults on the corner of the red brick building southwest of the garage. It stood directly between me and the sun, so all my watering eyes could detect was a silhouette of a very large peregrine. As I watched, another smaller peregrine came swooping in from the north. Prey dangled from its talons. It landed and awkwardly hopped towards the other peregrine, all the while making the “eeee-chup” sound of courting. Probably Hercules took the prey and while Probably Max looked on, she began to eat. PMax bobbed his head and “talked” to her as she ate his gift. When PHerc finished, she promptly turned her back on PMax and started to preen. Miss Manners PHerc ain’t. 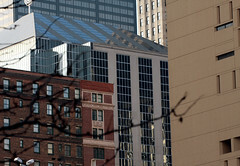 PMax dove from the building and flew directly to the western facing MCC niches (damn, Damn, DAMN! ), where I of course lost sight of him. I could sure hear him, though, as he made quite the racket calling to PHerc. She continued to look as if she was completely ignoring poor PMax, save for one or two quiet calls in his direction. Finally, PMax quieted and PHerc puffed her feathers out and settled down onto her feet. Although I couldn’t see her eyes, thanks to the blinding sun right behind her, everything indicated she was heading for naptime. I decided to head home. On my way to the elevators, I ran into one of the new security guards. I introduced myself and learned his name — Warren. I took Warren over to the rail and handed him my binocs so he could see PHerc. I have to say, Warren’s entire reaction to seeing PHerc and hearing the story of the MCC falcons reminded me SO much of 2006 security guard James – utter joyful enthusiasm. I think this is going to be a good, good year. A few days later, I looked out the window of our loft (this was Friday, I believe) and saw PHerc sitting on her favorite perch, the camera jut out on the roof of the MCC. As I watched, PMax swooped down and landed right on top of her. Copulation ensued. So. Everything is right on schedule with the jail birds. Good! 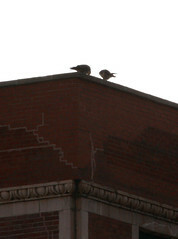 In other news, on March 13 on my way into work, I looked up at the top of the museum and spotted two peregrines! Is this the couple from last year? I don’t know yet, but they do seem to be interested in exactly the same spot. I watched them wander around the eastern corner of the museum’s northern roof inset for at least a half hour, making lots of courting type noise to each other. At some point, the male pushed what looked to be an American Woodcock towards the female. She flew off, sat up on the roof glaring down at him for a minute while he called to her and then came back down to eat a bit. Finally, she flew off to the southwest. After awhile, one of our unruly northside crows decided to make an aggressive pass at the peregrine sitting on the ledge – yeah, great idea! I guess the crow thought it might have a chance with the other falcon gone. 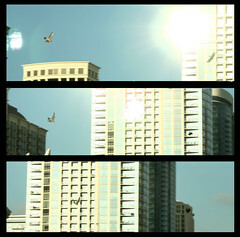 I got a number of grainy pictures of the peregrine sort of lazily hopping off the ledge and driving the crow away. The crow was driven to ground, but no one got hurt. As soon as it got onto the ground, it hopped into the cover of a bush and started making all sorts of noise. Needless to say, obnoxious lad finally found himself surrounded by the bully brigade with no adults around – somewhere around mid-school year – and not surprisingly, no one came to his aid as he was getting smeared. It was one of those, “He sorta had that coming…” kind of things. Let’s hope this crow learned its lesson. 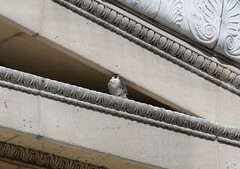 Since the 13th, many people have seen the peregrine pair on both the north and south sides of the museum. Mary and I have our fingers quadruple crossed that the pair will actually nest this year rather than tease us for a month only to disappear. I have two other things to report, both sad. Etienne, the adult male of the Wacker nest and mate to Rahn, died over the winter. The necropsy revealed a bad bacterial infection in his crop. Bird monitors picked him up on the street. He was emaciated and very ill. Fortunately, he did not suffer long. He passed the first night after his rescue. Etienne was probably my favorite photographic subject. He was one of the smallest peregrines in Chicago and absolutely gorgeous. He was also a very, very good father and mate. Whenever I opened the door to the ledge on Wacker, Etienne would immediately land and plant himself firmly between me and his chicks/mate. He wouldn’t move the entire time. I suppose that’s why I got so many good pictures of him. I will miss him a great deal. 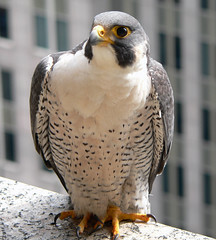 Secondly, a Flickr photographer posted a picture to Midwest Peregrine Falcons on March 12th of a peregrine on the ground by UIC. Looking at the picture, it seemed fairly obvious to me that the bird wasn’t well and wondered if it wasn’t the UIC female, Rosie, who is an older bird. Today, I talked to Mary about the circumstances. I’m happy to report that the peregrine was not one of the UIC adults from last year. I’m sad to report that he did die. We have him here and a necropsy is scheduled. His name was Perry (banded b/g 65/M) and he fledged from a nest in Milwaukee in 2003. As difficult as it all is, this is the natural cycle for these birds. From the timeline I’ve been given, it seems as though Perry did not suffer, but died rather quickly after grounding. ~ by Steph on March 24, 2008.